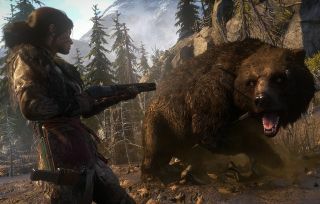 Get up to a 33 percent improvement in Rise of the Tomb Raider. When AMD and Nvidia promise performance gains from a new driver, it's usually in the neighborhood of just a few percentage points. That is not the case with Nvidia's new "Game Ready" 378.78 driver. It's built to deliver the optimal gaming experience for Ghost Recon: Wildlands, but in addition to that, it turbo charges several DirectX 12 games, culminating in up to a generous 33 percent boost in Rise of the Tomb Raider. With the exception of The Division, the performance gain from installing the new driver is either a double-digit percentage bump, or right at double digits, the latter of which is the case with Ashes of Singularity and Gears of War 4. The Division, meanwhile, sports up to a 4 percent increase in framerates—a modest improvement, but a jump in performance nonetheless. For those who are interested in taking in-game screenshots, Nvidia also added Ansel support to Ghost Recon: Wildlands. In games that support Ansel, users can move the camera to any angle, apply filters, use super resolution capture, and capture footage in 360 for viewing in VR. It's basically a much fancier version of hitting the Print Screen key. Outside of Wildlands, Ansel is supported in ARK: Survival Evolved, Conan Exiles, Dishonored 2, Mirror’s Edge Catalyst, Obduction, Paragon, War Thunder, Watch Dogs 2, The Witcher 3: Wild Hunt, and The Witness. There are plans to add Ansel support to more games, including the upcoming Lawbreakers and Mass Effect: Andromeda. Nvidia's 378.78 driver also brings full support for the mighty GeForce GTX 1080 Ti, for which we have a review in progress. In short, it offers better than Titan X (Pascal version) performance for the much lower price point of $700. Go here to download the new driver.